From the street, June’s gardens don’t look out of the ordinary, but on further inspection you’ll spy a host of treasures, including angels, cherubs, geese, pigs and fairies. When her contractor landscaped the yard, June had a few requests. She wanted purple clematis vines on the back trellis, she preferred blooming plants with darker colors—purples, blues, dark reds, magentas, dark pinks—and she wanted blooms from spring to fall. 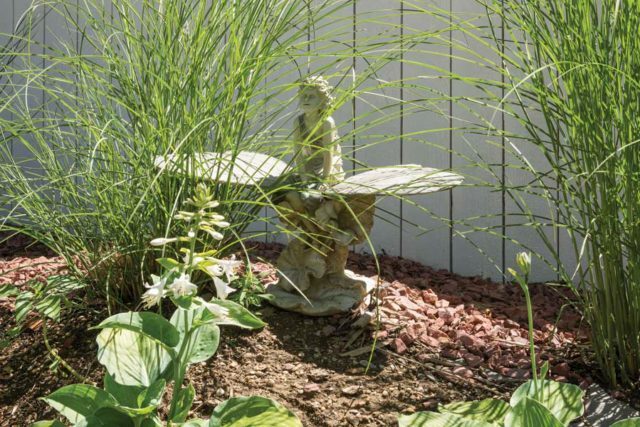 While the front and side yards were more traditionally landscaped, the backyard was to contain her fairy garden. 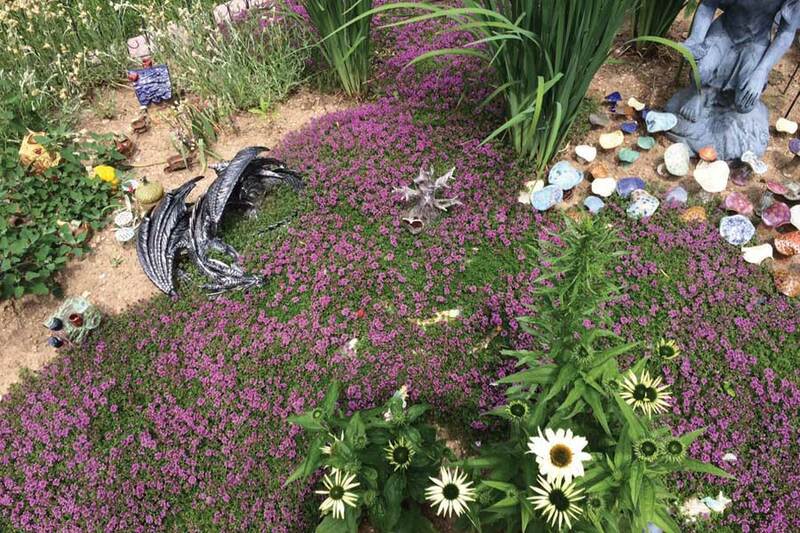 Her intention for her fairy garden was to create a space for magic and imagination, she says. “Kids, especially little girls, they SO believe in it,” June says. 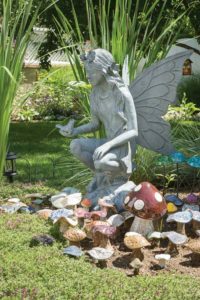 And she wanted to enhance their wonder by adding places for fairies to gather, along with whimsical creatures, décor and plants. 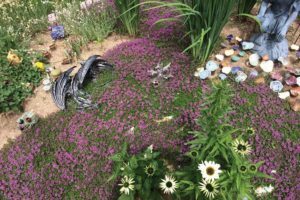 Beyond the fairy garden’s perimeter, June’s “tchotchkes” invoke more playfulness. 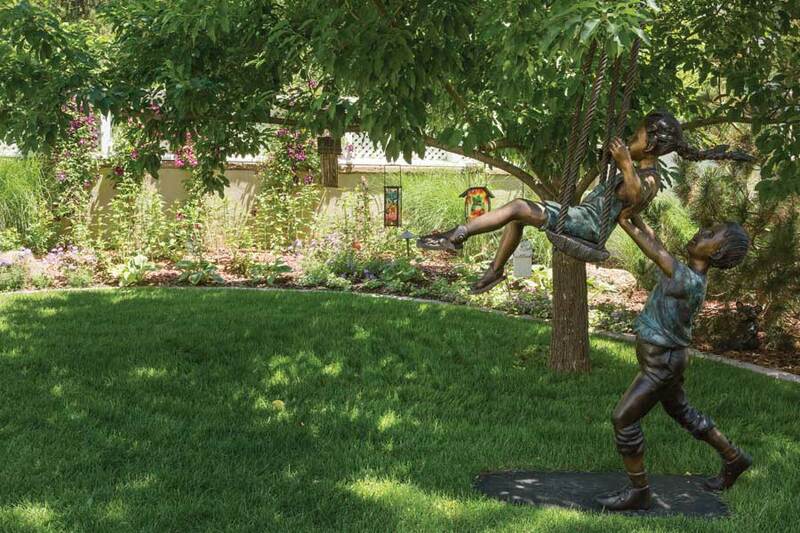 These hidden statues and trinkets were inspired by a childhood memory of her aunt. 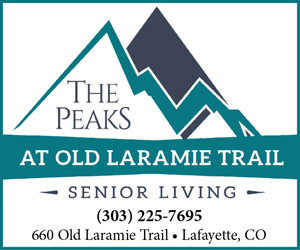 “When I was young, we would go to my aunt Ruth’s house. She had these animal statues and they were chipped and looked awful,” June recalls. 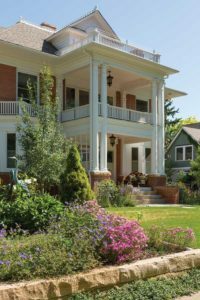 “But as a kid, I couldn’t wait to go over there and run into the yard and look at them. I just loved it! And it didn’t make any difference if one ear was missing or a nose was gone. 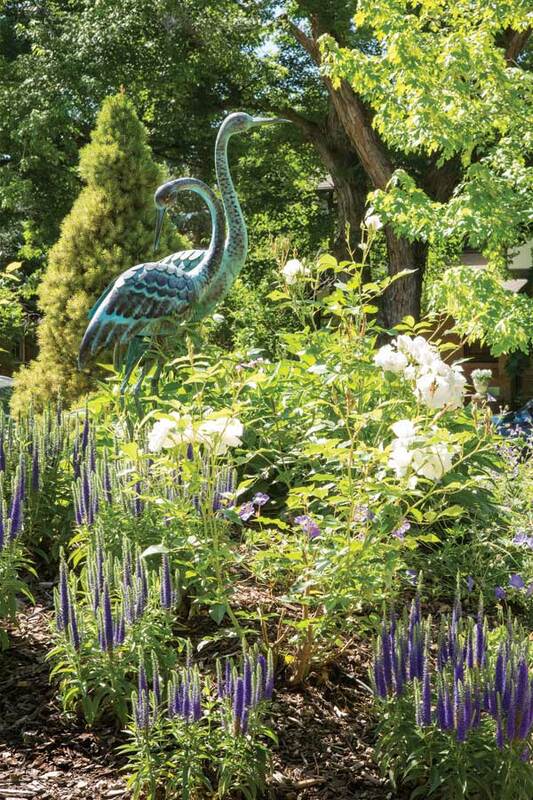 Indeed, walking through June’s garden is like going on a treasure hunt. You’ll find fish swimming through the grass, fairies sleeping under moss, and a couple of fierce dragons that keep the fairies safe. So open your eyes wide or you’ll miss the treasures in the foliage. 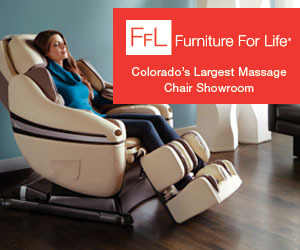 And if you pay extra-close attention, you just might see a fairy buzz by. The fairy garden is the centerpiece of June’s yard, but a bronze of children playing on a swing grabs the attention of both children and adults. 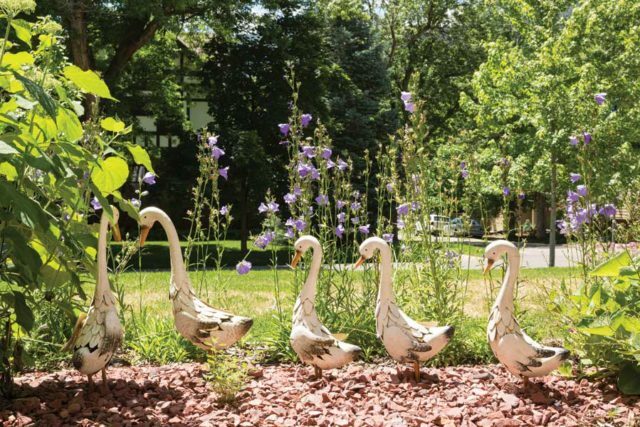 A family of geese gracefully meander across June’s front yard. A water nymph frolics amid the grasses while seated on a water lily. 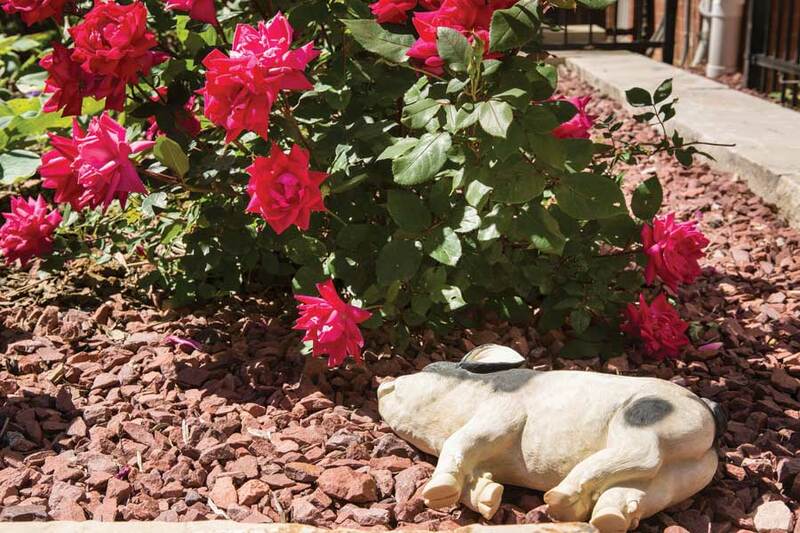 If you’re a pig, there’s no better place to snooze than beneath a rosebush in the hot sunshine. 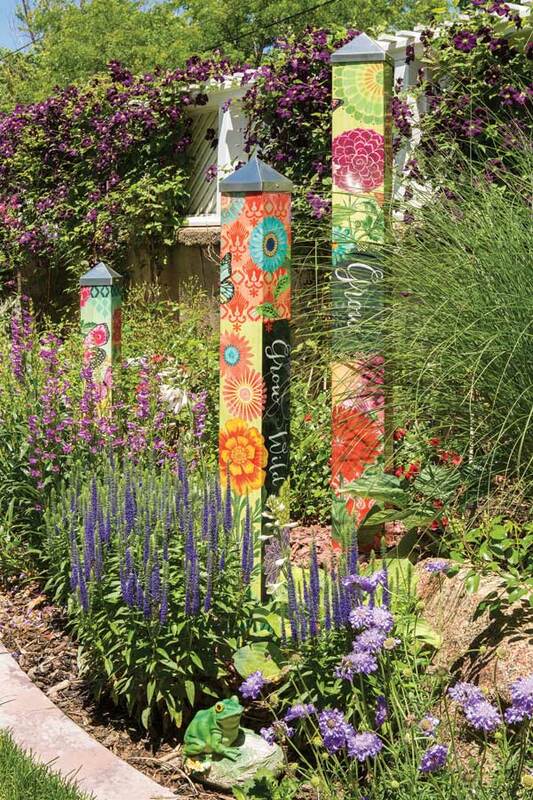 Purple clematis covers the fence and trellis, and whimsical garden posts inspire plants to grow and toads to croak. 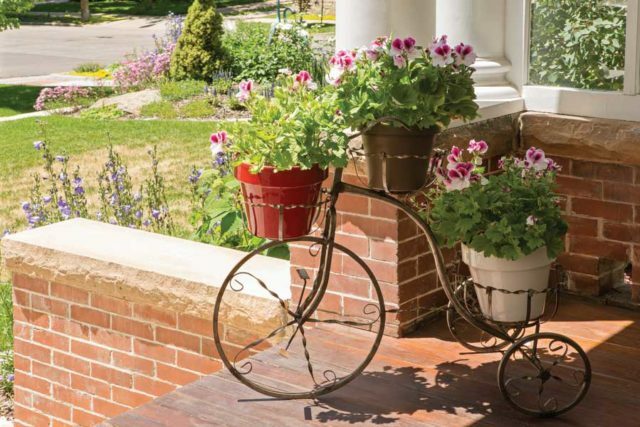 An old-fashioned bicycle is the perfect perch for pots of pansies on the front porch. Keep your eyes peeled, or you’ll miss the angelic faces in the foliage. 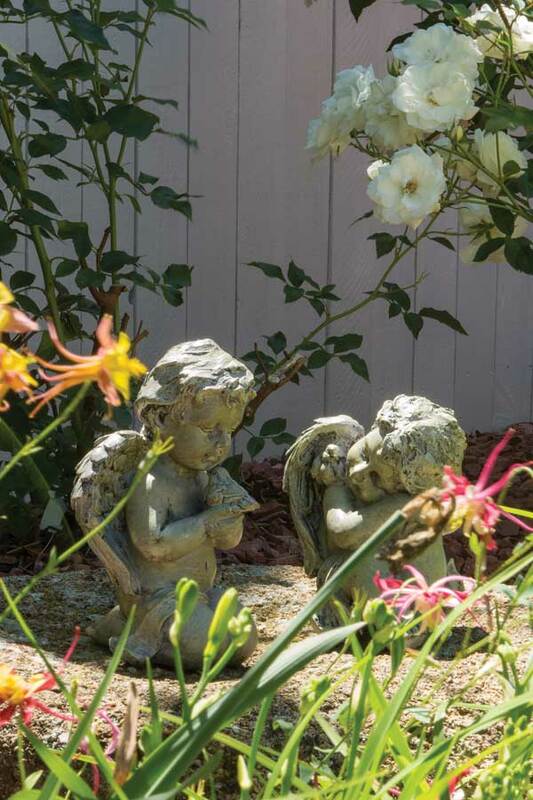 These cherubs occupy a boulder beneath some rosebushes. 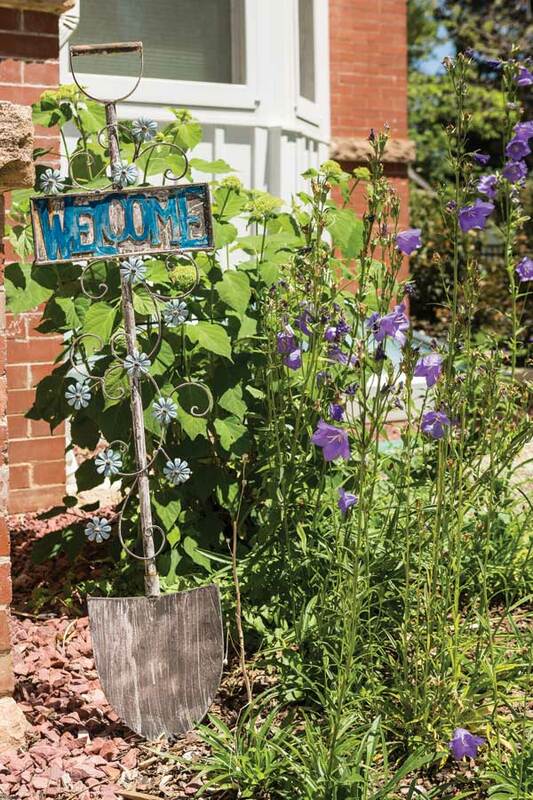 A weathered shovel-turned-welcome-sign sits beside purple balloon flowers to greet visitors at the front porch. 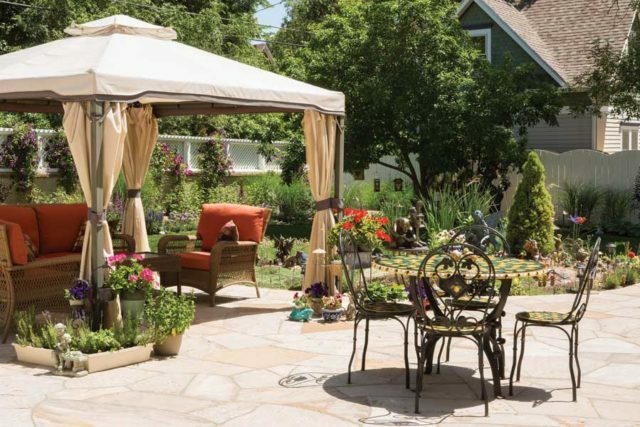 The cozy, covered sitting area overlooks the fenced-in fairy garden in the center of the backyard. A pair of swans grace the front corner of the property. 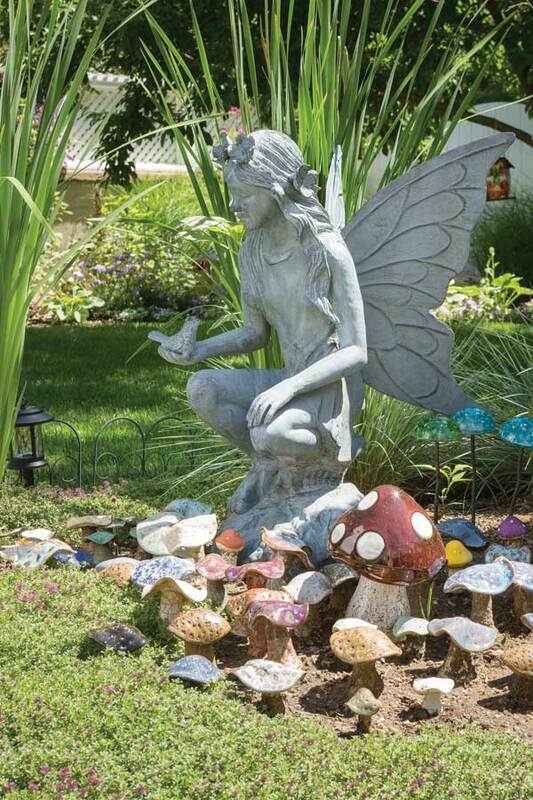 A large fairy keeps watch over a village of fairy houses and mushrooms, many of which June crafted from clay in her studio. This garden was carved out of a hillside and “set” in amazing stonework.